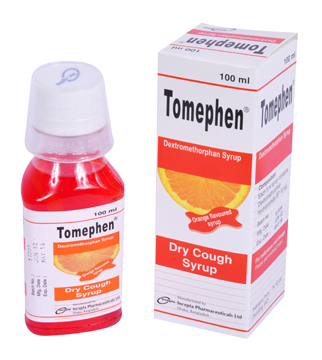 Tomephen Syrup: Each 5 ml of syrup contains Dextromethorphan Hydrobromide BP 10 mg.
Dextromethorphan is the d-isomer of the codeine analog of levorphanol, but does not have any opiate-like effects. It is a non-narcotic antitussive. Its cough suppressant action is due to a central action on the cough center in the medulla. Dextromethorphan does not induce tolerance, and has no potential for addiction like opiates. Dextromethorphan is used to relieve dry cough caused by a cold, flu or other conditions. Tomephen is an orally administered syrup. Adults (>12 years of age): 10-20 mg (1-2 teaspoonful) every 4 hours, or 30 mg (3 teaspoonful) every 6-8 hours. Do not exceed 120 mg (12 teaspoonful) in 24 hours. 6 to 12 years of age: 5-10 mg (1/2-1 teaspoonful) every 4 hours, or 15 mg (11/2 teaspoonful) every 6-8 hours. Do not exceed 60 mg (6 teaspoonful) in 24 hours. 2 to 6 years of age: 2.5-5 mg (1/4-1/2 teaspoonful) every 4 hours, or 7.5 mg (3/4 teaspoonful) every 6-8 hours. Do not exceed 30 mg (3 teaspoonful) in 24 hours. <2 years of age: Use only as directed by the physician. Adverse effects with Dextromethorphan appear to be rare and may include dizziness and gastrointestinal disturbances. Do not use Dextromethorphan to control a cough that is associated with smoking, asthma, or emphysema, or a cough that is productive (produces sputum or phlegm). Pregnancy: Adequate and well-controlled studies in human have not been done. However, Dextromethorphan has not been reported to cause birth defects. Lactation: It is not known whether dextromethorphan passes into breast milk. However, Dextromethorphan has not been reported to cause problems in nursing babies.